Through-the-wall imaging (TWI) is a difficult but important task for both law enforcement and military missions. Acquiring information on both the internal features of a structure and the location of people inside plays an important role in many fields such as antiterrorism, hostage search and rescue, and barricade situations. Up to now, a number of promising experimental systems have been developed to validate and evaluate diverse imaging methods, most of which are based on a linear antenna array to obtain an image of the objects. However, these methods typically use the backward projection (BP) algorithm based on ellipse curves, which usually generates additional ghost images. In this paper, the algorithm using the location inverse solution (LIS) to reduce the ghost images is proposed and simulated. The results of simulation show that this approach is feasible. Imaging through obstacles such as walls, doors, and other visually opaque materials using microwave signals is considered a powerful tool for a variety of applications in both military missions and commercial enterprises. To achieve two-dimensional image reconstruction requires the resolution of scattered objects in both range and cross range directions. In order to create an image of the interior of an obstacle, the probing signal must be able to pass through the obstacle with little attenuation. For through-the-wall imaging systems the material properties of the wall determine the degree to which a system can be successful. The major considerations are the absorption and refraction losses for the penetrating radiation. Data taken by Frazier  show that most building material is relatively transparent from 250 MHz to 3 GHz. So a system that uses frequencies below 3 GHz has the best chance of seeing through walls. Above 3 GHz, the attenuation in all materials begins to increase rapidly. This limits the range resolution but a 3 GHz bandwidth is wide enough to work successfully in many fields of application. 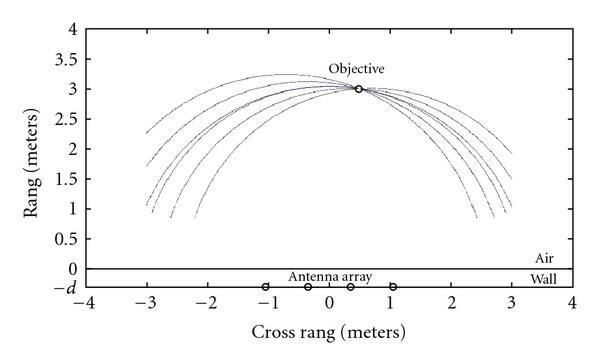 Resolution in the cross range direction is a function of the antenna aperture. One approach is to move the radar to acquire data at various intervals and then to synthesize an antenna aperture to obtain higher cross range resolution, but this method makes the operation and processing work more difficult and increases the cost of the system in practice. Another approach is to keep the radar at a fixed location and synthesize an aperture from a linear antenna array. This method is widely used, owing to its inherent advantages such as ease of operation and processing and so forth . The basic method of reconstructing an image of the inside of an obstacle consists of sampling the scattered signals and using backward projection (BP) algorithms to remove ambiguities in the location of objects, which scatter the probing signal. This forms an image of the inside of the obstacle showing the relative locations of objects causing the signal scatter [4–6]. For a linear antenna array, data are collected by scanning one antenna pair of the array at a time. One antenna transmits while the other receives. For example, supposing a system with 4 antennas, we can get 12 independent combinations. Each individual transmit/receive antenna pair creates a range profile for all of the objects creating scatter in the antenna field of view. The bistatic range to each object in the image map is used as an index in the range profile. For a different antenna pair, the bistatic range to the same object will be different. The values from all of the antenna pairs from the scanning array are summed for each pixel in the image map. Where there are objects in the image that result in scattering, the individual observations from the antenna pairs will be in phase and sum to a large value. Where there are no objects, the individual observations will be out of phase and tend to sum towards zero. The magnitude of the summation depends on the radar cross section of the scattering object and the distance from the antenna array . Figure 1 shows a schematic view of the reconstruction of a point object in the image map for a 4-element array. Reconstruction of a point object in the image map. where indicates the pixel intensity at location of the imaging field, is the corresponding propagation delay of the sampling data , and is the corresponding propagation delay of the location to the th antenna pair. Figure 2 is an original imaging result of six point objects, located at , and , the wall thickness is m, and the wall dielectric constant is . Generally, the location of an object in the imaging field always has a large value due to the sum of in phase components (as shown in Figure 1). If there are more than one point object needed to be imaged with the ellipse curve set, some ghost images will exist due to the intersections of the different ellipse curve sets. Some intersections also have a relatively large value due to the sum of the in-phase curves and then generate false objects in the imaging field. Figure 3 shows a schematic view of the generation of a ghost image due to the intersections of the different ellipse curve sets. An illustration of the ghost intersection. Theoretically, an increase in the number of antennas and objects needed to be imaged will generate more intersections, which consequently generate more ghost images in the image field. 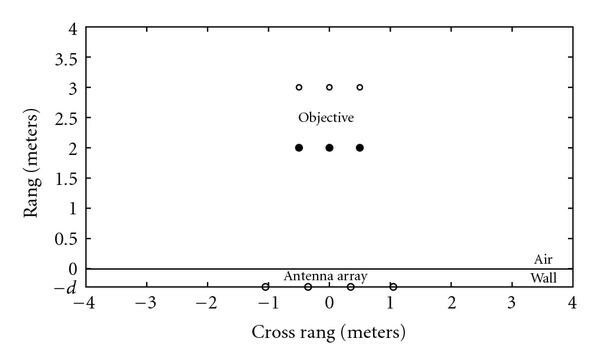 In order to simulate the imaging algorithm, an imaging system is assumed as shown in Figure 4, in which a linear antenna array is placed against the wall with four of the same antennas each spaced 0.7 m apart from its neighbor. The wall material is uniform with a thickness and a dielectric constant . The system emits 0.4 nanosecond-width pulse signals to probe the image field. The bandwidth is 2.5 GHz and the six assumed point objects are located at . Suppose that the noise function is a normal random function, the sampling interval is ns, the sampling number is enough to image the view field, and the three point objects close to the antenna array have a three times greater scattering intensity than the other three point objects. In order to simplify the simulation, we suppose that the 12 propagation delay contour curves corresponding to 12 antenna pair combinations have the same intensity for each point object, although, in practice, they are generally different due to the different traveling distances and the different scattering characteristics relevant to the different incident angles to the object. Geometry for computing propagation delay on reception. 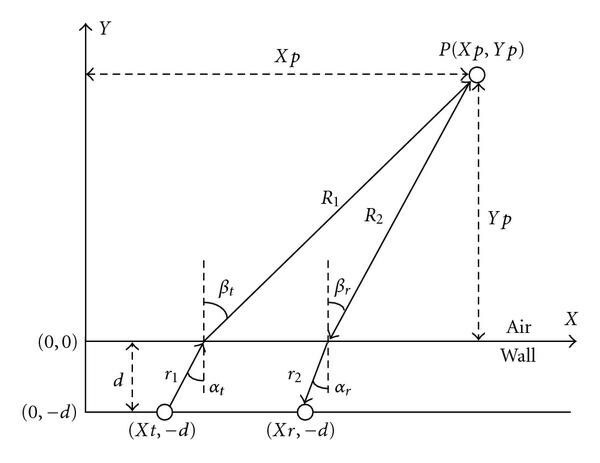 and the propagation delay contour depicted by the sampling data is distorted to a quasiellipse curve due to the propagation speed change and the refraction between the wall and the air. In the following, we will discuss the imaging results for both known and unknown wall parameters. In this section, we suppose that the wall parameters are known a priori. We assume that the wall dielectric constant is (corresponding to a concrete wall ), and the wall thickness is m.
and then we use (4)–(7) to generate the original imaging result as shown in Figure 2. In Figure 2, besides the image of six point objects, there are a large number of ghost images. 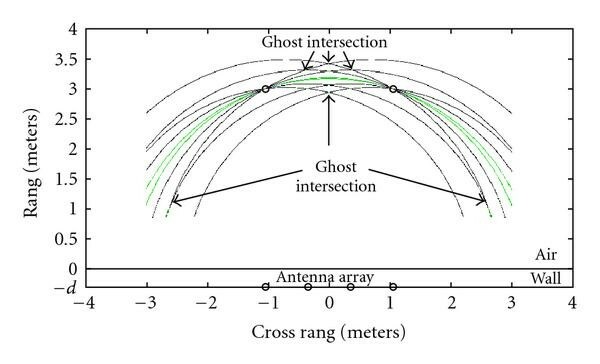 The intensities of some ghost images are even stronger than the intensities of the three weak point objects (i.e., the three point objects far away from the antenna array in Figure 4). To get the correct image of objects, ghost images need to be eliminated. Using an imaging probability function (IPF) to remove the ghost images is a feasible approach . It comes from an initial assumption that if all the receivers receive the scattering signal, then the location of an object in the image field will have 12 addition operations in phase due to the 4 antennas, whereas the location, where has no object in the image field, will have relatively less probability of getting addition operations in phase. Therefore, the object can be distinguished from the ghost image by using proper imaging probability gating. Figure 6 shows the result of using an imaging probability function (IPF) to reduce ghost images. Compared with the original image (as shown in Figure 2), the imaging quality of Figure 6 has been significantly improved. Although the imaging result of Figure 6 is gratifying, several ghost images distributed in the image field can still be found. These ghost images result in the presence of false objects and prevent the images of the objects from being focused on their centers. This is mainly due to the inherent disadvantage of the imaging algorithm using ellipse curves. To further suppress the ghost image, we introduce the approach of using the location inverse solution. using (8) and (9), and the locations of the th object in the 12 antenna pairs can be computed as . indicates the probability of the summation operation being in phase. If the th object is a false object, its will obviously be less than 1. Therefore, we can easily distinguish the true object from the ghost image by using a proper gating of the imaging probability function. The same procedure is repeated for all the other objects in the image field. Figure 7 is the imaging result by using the location inverse solution approach. Compared with Figures 6 and 7 shows that the ghost images have been reduced even more, and the centers of the images of point objects have been better focused. In a practical situation, the values of the wall parameters usually are not exactly known. Although some researchers have proposed various approaches for estimating the material parameters of an unknown wall on site , to get the exact parameters of the unknown wall in real time is still difficult. It is usual to estimate values from the literature and employ experience in substituting these for the true values of the wall parameters in practice. To demonstrate the simulation experiment, we specify that is the estimated wall thickness, is the true wall thickness, is the estimated wall dielectric constant, and is the true wall dielectric constant. Firstly, we analyze the effect of the wall thickness including error while the wall dielectric constant is known exactly, that is, , where is the error between the estimated thickness and the true thickness. Figure 8 is the imaging result using location inverse solution to remove ghost images, while the estimated wall thickness is less than the true value, that is, . As shown in Figure 8, when , the imaging locations of point objects are shifted far away from the antenna array. Figure 9 is the imaging result using the location inverse solution to remove the ghost images, while the estimated wall thickness is larger than the true value, that is, . As shown in Figure 9, when , the imaging locations of point objects are shifted close to the antenna array. Secondly, we analyze the effect of the wall dielectric constant including error while the wall thickness is known exactly, that is, m, , where is the error between the estimated dielectric constant and the true dielectric constant. Figure 10 is the imaging result using the location inverse solution to remove the ghost images, while the estimated wall dielectric constant is less than the true value, that is, . As shown in Figure 10, when , the imaging locations of point objects are shifted far away from the antenna array. Figure 11 is the imaging result using the location inverse solution to remove ghost images, while the estimated dielectric constant is larger than the true value, that is, . As shown in Figure 11, when , the imaging locations of point objects are shifted close to the antenna array. In practice, when both of the wall parameters have errors, the final shift of the object's location will depend on the effects of both the wall thickness error and the wall dielectric constant error. The simulation result of the object's location shift due to the errors of the wall parameters between the estimated value and the true value is consistent with the result of . Figures 7–11 show that the approach, using the location inverse solution to remove the ghost image, is insensitive to the wall parameter ambiguities, and can work efficiently both when the wall parameters are known and unknown. In this paper, a new algorithm using the location inverse solution based on IPF to reduce the ghost image is introduced. It can overcome the disadvantages of the conventional ellipse curve imaging algorithm. The results of simulation experiment show that it can effectively and significantly remove the ghost images whether the wall parameters are known or unknown. Furthermore, it will not deteriorate the imaging quality of weak scattering objects. Our results are based on simulations, and we are currently exploring real-time hardware implementation. In practice, proper preprocessing measures, such as antenna demodulation, noncoherent integration of multiple pulses, multichannel calibration and time delay compensation, and so forth, should be employed to enhance the quality of received signal [9, 10]. With current technological advances, such system can operate in near real-time thereby providing rapid and covert detection of target obscured by walls for antiterrorism and law enforcement applications. This research was partly supported by the China Scholarship Council under Grant no. 2007A55018.